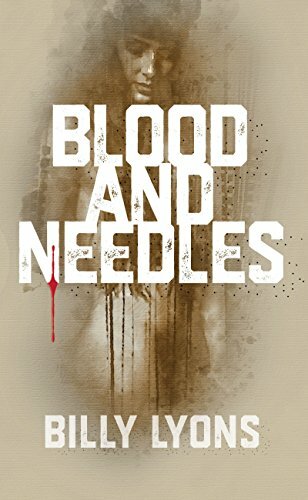 Billy Lyons' Blood and Needles is not your grandmother's romance! The last person 25-year-old junkie, Steven expected to meet was Anna Marie, an alluring stranger who turns out to be a fellow junkie...and a vampire. Anna Marie senses an inner steel deep inside Steven, and offers him a membership in the seductive world of The Morphia Clan, a group of vampires as devoted to using narcotics as much as they are to drinking blood. Steven soon falls in love with Anna Marie, whose vampire throne is threatened from outside forces and from within. There are hidden dangers everywhere and treachery and betrayal lie just around every corner. Soon Steven finds himself not only in a fight to save his own life but also the life of the vampire he loves. Billy Lyons is the contributing writer of book and movie reviews at Muzzleland Press. His work has been published in the High Strange Horror anthology and the Another Realm e-zine. He lives in Doran, Virginia. Blood and Needles is his first full length novel and he is already hard at work on a follow-up. Coming in May - The Sizzling Romance - Do You Love Me?